Weight-loss reality shows make it seem like losing dozens of pounds per week is normal and doable. In real life, a safe and sustainable weight loss rate is just 1 to 2 pounds per week. But even that rate varies according to how much weight you have to lose, your dedication to the process, your hormones and your genetics. Although weight loss seems simple -- create a calorie deficit and shed pounds -- it's much easier on paper than in execution. Understanding how weight loss works helps you to figure out how long it will take for you to reach your goal. A pound equals 3,500 calories; so to lose 1 pound, you must burn 3,500 calories more than you consume. Burning 500 to 1,000 calories a day more than you eat every day enables you to lose 1 to 2 pounds per week. When you create this deficit by only cutting 500 to 1,000 calories from what you eat daily, you may be left calorie deficient. Some sedentary women over age 50, for example, burn just 1,600 calories per day. Lowering this daily calorie intake by even 500 calories will lead to too few calories consumed. Dipping below 1,200 calories per day for a woman can leave her nutritionally deficient and hungry. For men, 1,600 calories is extremely low, and lower intakes shouldn't be followed without medical supervision. Not eating enough calories can lead to nutrient deficiencies and leave you weak, nauseous and hungry. Feeling fatigued may deter you from exercising, but physical activity is another important component in creating a deficit and losing weight. A combination of diet and exercise is best for long-term sustainable weight loss. 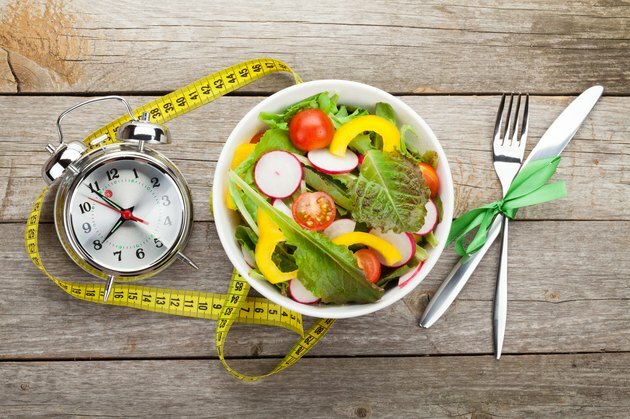 A meta-analysis published in the Journal of the Academy of Nutrition and Dietetics in 2014 found that dietary intervention worked for weight loss in the short term, but a combination of diet and exercise was most effective for weight loss that lasts over a year. A dietitian or an online calculator can help you estimate your calorie needs. A fitness professional may use a formula that takes into account your weight, age, height and gender to determine your resting metabolic rate -- the amount of calories your body uses to simply exist -- and then add in any additional calories burned from your daily activities, including exercise. The most accurate way to determine your resting metabolic rate is with indirect calorimetry, but this requires special equipment in a clinic and usually a steep fee. Once you know your estimated daily calorie needs, you can then devise what makes a realistic deficit. Ask yourself how much time you have for extra exercise, how much motivation you have, and what kind of sacrifices you're willing to make in your diet. For example, for a 500-calorie deficit that yields a loss of 1 pound per week, plan to trim 250 calories from your intake and exercise to burn 250 more calories. Meals for weight loss emphasize whole, unprocessed foods such as whole grains, vegetables and lean proteins. Pay attention to portion sizes so you don't go over your weight-loss calorie rate. Fasting or reducing your caloric intake far below your resting metabolic rate may have disastrous consequences for weight loss. If you choose to trim calories drastically to stimulate faster weight loss, your attempts often backfire. Too extreme of a calorie reduction may reduce your resting metabolic rate by 20 to 30 percent. This can slow the rate at which you lose weight. For example, suppose you need exactly 2,200 calories per day because you have a resting metabolic rate of 1,300 calories and burn an additional 900 through exercise and daily activities, and you decide to follow a 1,000-calorie-per day diet to lose more than 2 pounds per week. You manage to stick to this extreme restriction for a couple of weeks, and, in response, your resting metabolic rate drops by 20 percent -- to just 1,040 calories per day -- since your body senses deprivation and conserves energy to prevent starving. You also skip a few workouts because you just don't have the energy. On the days you do work out, you can't put in as much calorie-burning effort because you're low on fuel. Your weight loss slows down from 2.4 pounds per week to just 1/2 or 1 pound per week, despite your caloric deprivation. Your efforts were too aggressive, and now, you're not burning as many calories and aren't losing weight at your desired rate. To prevent a drop in your resting metabolic rate when dieting, exercise is a must. Trim no more than 500 calories from your daily food intake, and add 250 to 1,000 calories worth of exercise per day to create your weight-loss deficit. The American College of Sports Medicine guidelines advise 200 to 300 minutes of moderate-intensity exercise weekly to achieve significant weight loss. This amount should lead to a 2,000-calorie or greater burn per week -- or about 300 calories per day. Know your limitations when setting exercise goals. Ask yourself if you're physically able to undertake the intensity of planned calorie-burning workouts. Also, ask yourself if you can fit in the necessary time among work and family obligations to meet your goals. If you're out of shape, you can't expect to start exercising for long durations or intense levels right away. This leaves you vulnerable to injury and burn out. You must also budget in days to allow your muscles to recover, so you can't go 100 percent every day. These factors dictate how fast you lose weight. If you can't manage a lot of exercise at first, or ever, you can still lose weight, but at a slower rate. A strength-training exercise session doesn't burn as many calories as a run, but it's also an asset to weight loss. It helps you build lean muscle, which raises your resting metabolism. People with lower body fat percentages have higher resting metabolisms, if all other factors are equal. But strength-training may affect your weight-loss rate too. If your clothes fit looser, but the number on the scale doesn't budge, you may be losing fat and gaining muscle. A pound of muscle takes up less room than a pound of fat, so you look slimmer when you have more muscle mass, even if your physical weight is the same. The more weight you need to lose, the faster it comes off initially, which is why participants on reality weight-loss shows tend to lose weight at accelerated rates. If you're hundreds of pounds overweight, 10 pounds is a small percentage of your weight and may come off in a week or two. But, when you only need to lose 15 pounds, it will take much more time to lose 10 pounds. As you lose significant weight, your weight loss rate slows down. Your metabolism is partly based on your size; when that size shrinks, so does your metabolism. The deficit that led to steady weight loss at the beginning of your plan may not allow you to lose at the same rate as you progress. You have to cut calories further, as much as 25 to 50 calories for every 5 pounds lost, to continue to lose weight. So, if you were initially able to lose weight on 1,600 calories per day, after you've lost 20 pounds, you may need to restrict to 1,350 to 1,475 to lose further. Alternatively, you could increase exercise to raise your calorie burn rate. In addition to hitting a plateau because your size is shrinking, other factors can slow your rate of loss. You may think that you're taking in a certain number of calories, but are actually underestimating your portion sizes. Unless you weigh and measure your food, you may be eating more than you think. Either overeating or under-exercising may lead to not actually hitting the calorie deficit you think you are. If you're several months into a weight-loss plan and have been doing the same exercise routine the entire time, your body may also have become accustomed to this level of work. You may need to shake things up to stimulate weight loss again. Reorder the exercises, add intervals of high-intensity work or adopt an entirely new mode of working out -- such as cycling instead of walking. You may want to lose weight at a rate of 2 pounds per week, but the changes required may just be too aggressive. If you settle for milder changes, such as trimming just 125 calories per day and exercising off 125 calories, you'll see more success. Weight loss will happen at just 1/2 pound per week, but you can actually achieve that goal -- rather than losing 2 pounds one week, only to see it return the following. How long it takes you to reach a certain number on the scale is less important than how your weight affects your energy and health. If you're overweight, losing even 5 to 10 percent of your current size can improve your health by reducing cholesterol levels, lowering blood pressure and normalizing blood sugar. Can Too Much Exercise and a Lack of Calories Cause Weight Gain?